Real men do eat quiche. Quiche does not have to be just for breakfast or brunch. You can make quiche with just about anything in your fridge. 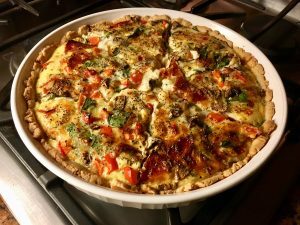 Quiche is one of my favorite meals for any time of year, any time of day and with any ingredients. Quiche is an entrée that can satisfy any craving or use up most leftovers in your fridge—Christmas ham or spinach or other veggies starting to lose their freshness, for example. 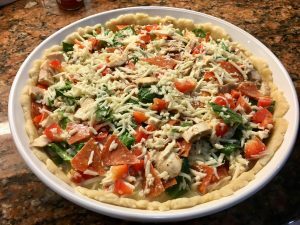 On Boxing Day, the day after Christmas, we had a pizza craving, so I made pizza quiche. You can swap out types of cheese and other fillings using this recipe to make any quiche you like. 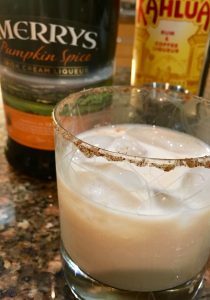 My very favorites have the standard filling ingredients and vary by what we have on hand or what we’re craving. Here are a few ideas to get you thinking. Get creative to create your own! In my opinion, the crust is the secret. 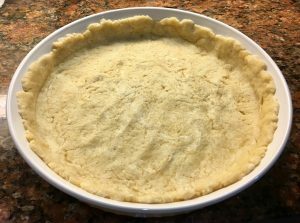 You can use any store-bought crust, but this one is so easy, really tasty, and worth the few minutes it takes to make. Mix all. Press into a quiche or pie pan or small casserole dish. Set aside. Now you can have some fun with fillings, depending on your taste and mood. ½ pound grated cheese (mozzarella, Swiss, Monterrey jack, cheddar). NOTE: One time I forgot to add the cheese and I could hardly tell the difference. Beat eggs until fluffy. Add remaining ingredients. Pour evenly into crust. Bake at 375 degrees Fahrenheit until set and slightly brown on top (about 35 minutes for a large quiche). Allow to cool before slicing. Don’t forget to pour a glass of your favorite wine to enjoy while making your quiche! You can get as gourmet as you’d like with your quiche. The beauty of this recipe is how easy it is, how flexible you can be with ingredients, and how hearty a meal it makes. You can mix and bake it ahead or mix it ahead and bake it so you can eat it fresh from the oven. This can easily be vegetarian. Please share your suggestions for making this recipe work for various diet issues if you’re vegan or require gluten-free. I’ll add your tips to the recipe (credited, of course). 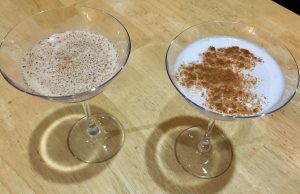 Please share photos on Facebook, Twitter or Instagram when you try the recipe. Life’s too short to spend it cooking. Bon appetite and cheers!